Oring’s work examines critical social issues through projects that incorporate old and new media to tell stories, examine public opinion and foster open exchange. Her use of tools typically employed by journalists — the camera, the typewriter, the pen, the interview and the archives — and she builds on experience in her former profession to create installations, performances, artist books and Internet-based works. Born in Norman, Okla., and raised in Grand Forks, N.D., Oring’s interest in art education became evident during her time in grade school. Her mother was active in her scholastic endeavors and participated in a program called “Picture Lady,” a volunteer initiative that taught kids at her school about art. “She and the other picture ladies would come into the classes, show a work by, say, Picasso, and then come up with an art project that related to the work for the kids to do,” said Oring. Following completion of high school, Oring moved to Colorado to study journalism at the University of Colorado. Although Oring received her Bachelor of Science in journalism, she took a different career route while completing her graduate degree. Her passion for art inspired her to obtain a Master of Fine Arts in visual arts from the University of California in San Diego. Admitting to being passionate about both journalism and art, Oring intertwined both degrees with a project entitled “I Wish to Say.” With this work, she dresses up in 1960s secretary attire, set up a public office — complete with a manual typewriter — and invited people to dictate postcards to the U.S. president. Oring compares the project to the person-on-the-street interview format, a common practice in journalism — but with a creative twist. Yet, she credits her project “Writers Block,” a piece created in Berlin as a tribute to those whose books were destroyed in the Nazi book burnings, as the work that really launched her art career. Berlin has played a significant role in Oring’s life and career. In 1997, she was invited to complete a fellowship in Berlin and describes the experience as “the pivotal moment that changed her life.” At that time, she was working as the editor at the San Francisco Chronicle but wanted change. “I wanted a change, and when I got the Arthur F. Burns fellowship, I took a six month leave from my job,” said Oring. “Once I got to Berlin, I didn’t want to go back, and ended up quitting my job and staying in Berlin for about six years.” When she returned to the U.S. she felt completely out of touch with the American public and their opinions of the political system. This led to the fruition of her work “I Wish to Say,” as the political divisiveness of the American public brought many things together for Oring as she thought about going out onto the street with a typewriter and asking people what they’d like to say to the public. Oring began teaching at UNCG in fall semester 2011. During her time at the university, she has completed several projects including the works mentioned above. 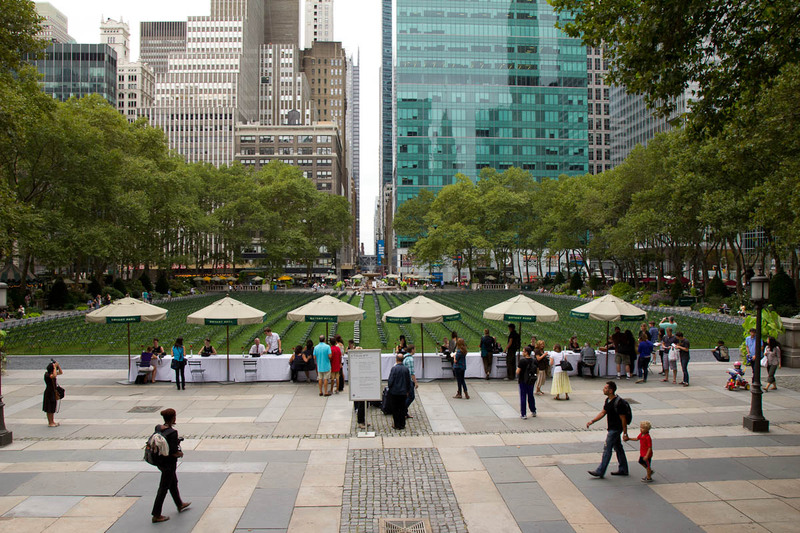 Currently she is working on the largest version to date of “I Wish to Say,” in collaboration with the PEN World Voices Festival set to take place on April 26 in New York City’s Bryant Park. “For this version of ‘I Wish to Say,’ 100 PEN writers will serve as typists during a daylong event in the park, at which we’ll invite the public to dictate postcards to president candidates,” said Oring, who is excited about the collaboration and believes it will allow the project to have a broader impact. A big fan of Michael Rakowitz’s work, and deeming Christine Hill as an early inspiration, Oring shows no sign of slowing down anytime soon. She is working on plans for performances at the Contemporary Art Museum in Raleigh and at SECCA in Winston-Salem — and is working on a book that will come out in the fall published by Intellect Books of the United Kingdom — all while pleasurably devoted to teaching art students at UNCG. More and more, Oring views teaching as a part of her creative practice and hopes that her legacy becomes visible through the lives of former students.